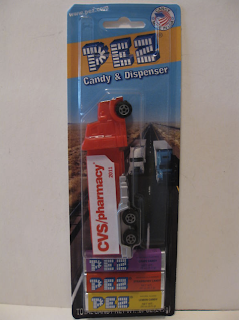 It seems the Pez Corporation is shifting its design focus from “colorful characters” and “cuddly critters” to “things you normally see but you don’t really care about.” The first in this visually stunning new line is the CVS Delivery Truck that lets kids experience the thrill of delivering palettes full of mouthwash and Bayer aspirin before the weekend rush. I’m especially disappointed with the 2011 printed on the side, because it implies they only make one of these a year. To be honest, I don’t think I want to live in a world where only one CVS delivery truck-shaped Pez dispenser is created each year. If this is where the bar is set, I can’t wait for Pez’s next line of dispensers, featuring timeless designs like a Dung Beetle, Brita Water Filter, and Applebee’s Hostess.